Do you know what a clafoutti is? 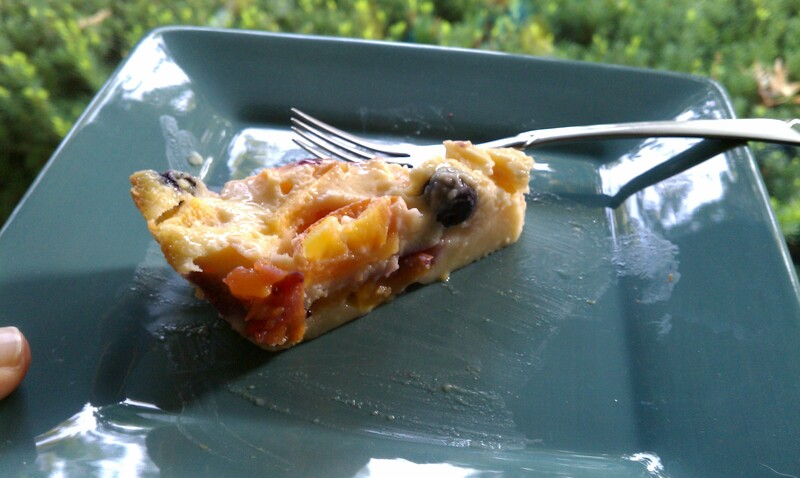 OK, It might actually be called a clafoutis, but that’s not nearly as fun to say. It’s my dessert, so I’m going with clafoutti. 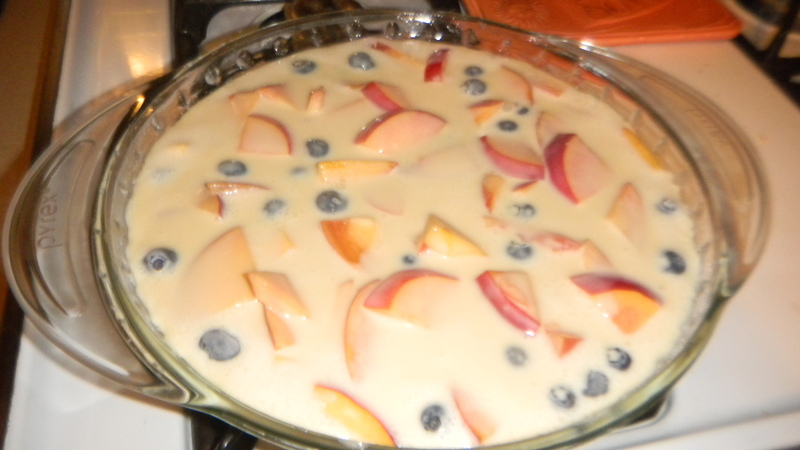 In any case, it’s a crustless, tart-like dessert that can be made with just about any fruit and has a custard base. Immediately after I got home from Lauren’s last Friday night, I set out to making the clafoutti for my in laws’ birthday celebration. Much to my surprise, and delight, Dan was already hard at work making custard and chopping fruit. So very nice, since it was already quite late and we would be up and at ’em early the next morning. This is another recipe Dan found and brought to me (like the grilled nectarine and bleu cheese crostini). How easy it this? 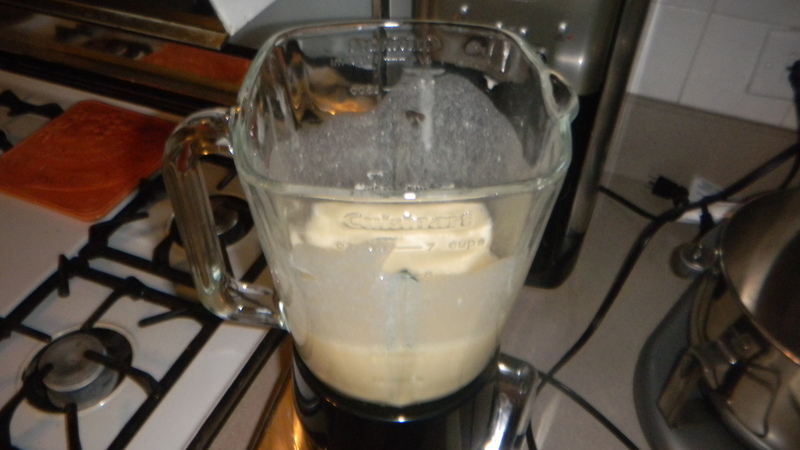 Put all of that into a blender and blend away on high for about a minute, stopping once to scrape the sides. 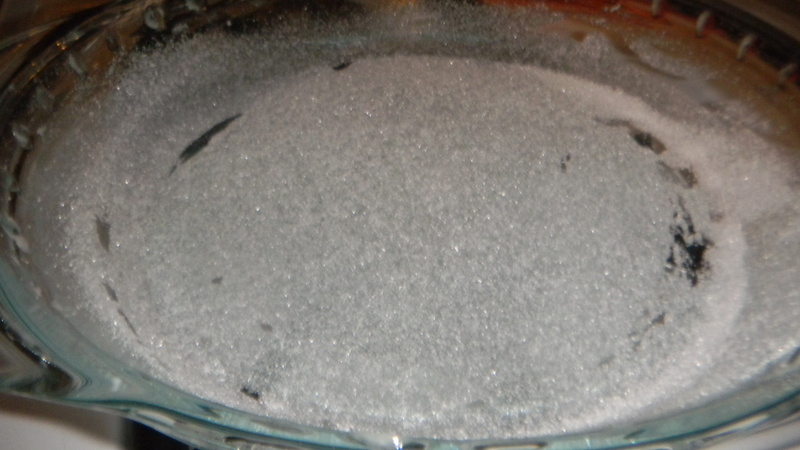 While that’s blending, get a glass pie pan ready by buttering the dish and sprinkling a thin layer of sugar in it. Add half the custard to the pie plate. Then put all of the fruit in. 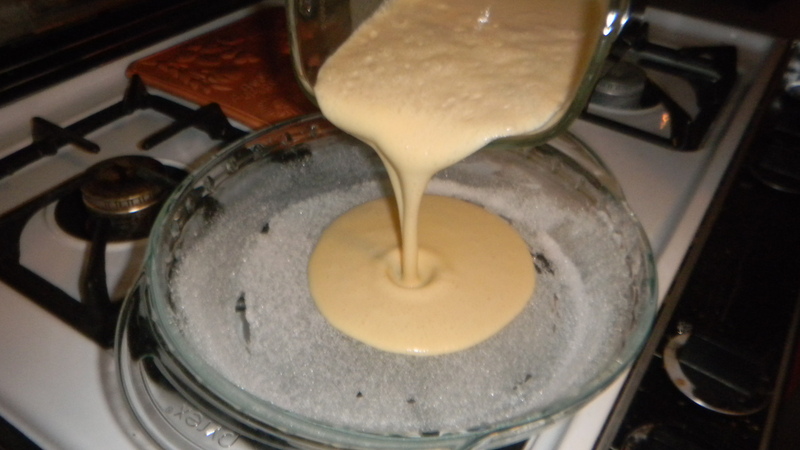 Finish pouring the custard out on top of the fruit. Bake at 350 degrees for about 50 minutes. You may need more time. The top should fluff up a bit and get a little brown. I really like that this dish is so versatile – you just need three cups of any type of fruit. 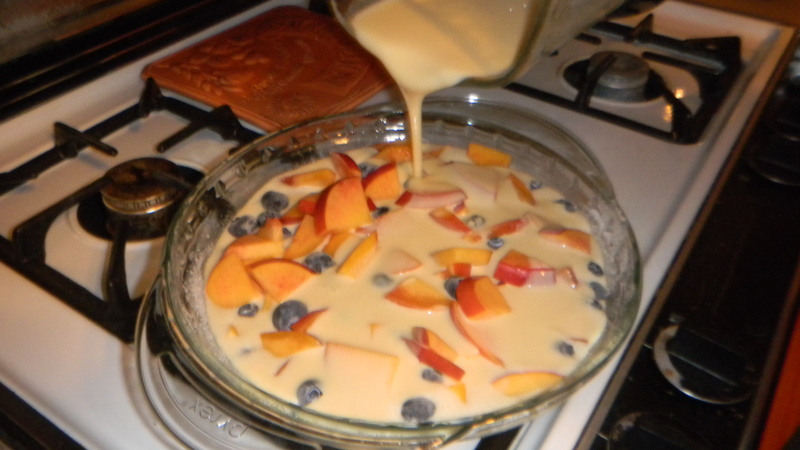 The custard serves as the neutral medium for the fruit flavors to come out. I really liked that except for the heavy cream, we had everything we needed already in the house. 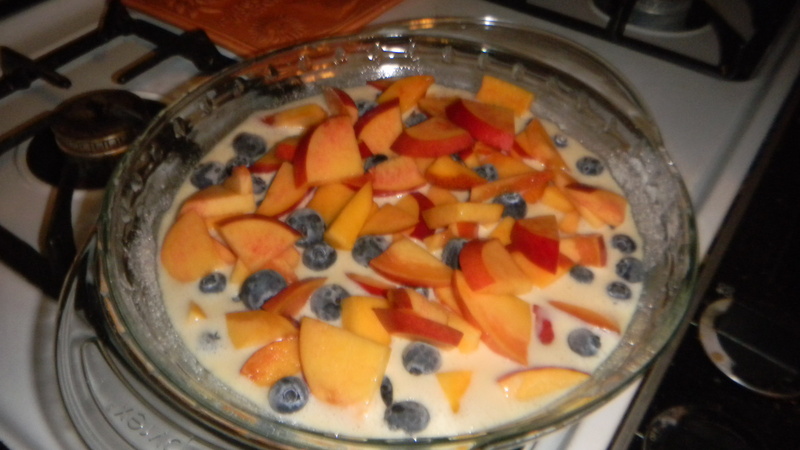 We went with a pretty basic mix of peaches and blueberries, since that’s what we had around, but I’d really like to try this with more exotic fruits, like mango, kiwi, or pineapple to see what happens. I would suggest letting the clafoutti sit out for about 10-15 minutes before it is served. When we ate it, the second piece tastes better than the first, because it was not as cold, and it was a little softer.